What’s a math worksheet without some challenging and exciting word problems? Math problems in a word format increase a student’s not just math skills but his problem-solving and analytical skills too. They are great in encouraging students to read, analyze, and solve which enhance their intelligence quotient. 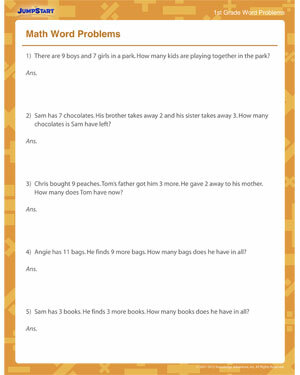 Have fun with our free math worksheet that has plenty of word problems for the little first graders.